If you're like me, and use non-standard colours on your blog, then you might find that some of the widgets you want to add, just don't work. This solution works for Twitter, but you might find it works for other services. Simply put, Twitter makes their own widgets available, meaning you're not limited to what Blogger offers. 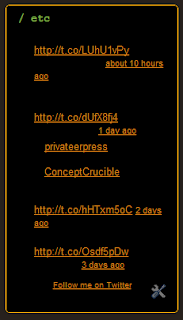 OK, so you're not actually changing bloggers text colour - you're just using a different widget. So, next time you're about to spend hours trying to tweak something... maybe there's an easier solution available by going straight to the source. These allow more than just showing your most recent posts. There are also ones to show your lists, favourites and searches. Just go to that site, choose the widget you want, and fill in your preferences. After that, it'll generate code for you, that you can plug in to your own HTML widget and place anywhere on your page.